This board book targeted for little ones ages one to three is the newest addition in the mini myths series for tots. This story is based on the myth of Medusa, the sea monster with hair of snakes who turned anyone who dared to look at her to stone. In Holub’s version children are introduced to a tot of the same name who does not like to brush her hair. Grandma is coming for a visit so dad chases Medusa around the house trying to get her to tame her hair. Medusa has other plans. She comes up with all kinds of stalling tactics. But Grandma is wise. She comes up with a solution that makes everyone happy. Each pages contains a large, simple illustration and no more than one sentence of text. As with other books in the series, the complete mythological story is included at the end for reference. Main characters are Mom and little Midas. There is no doubt that Midas is a stubborn child. He is finicky about what clothes to wear and the foods he eats, all of which must be yellow. When he decides to paint, the chosen color is yellow, but he gets upset when he can’t get the yellow paint off his stuffed dinosaur pet. Does everything have to be yellow? Will Dinoboo ever be the same? How can Midas solve his problem? 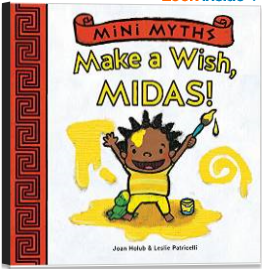 Cute story with the moral, “Be careful what you wish for.” Like Midas in the myth who got his wish to turn everything to gold, sometimes one has to think about the long-term consequences. Children will realize this when an adult explains to them what the myth is about. The author does a good job of simplification for little ones. The books have vibrant illustrations that are somewhat marred by smudge marks on some of the pages. This is clearly a printing issue that will probably not bother a toddler, but one that the adult buyer might want to examine. Summary: Medusa refuses to care for her hair, her long locks getting messier with each passing page. Her hair rebellion elicits frozen expressions of shock from her family, but nothing will convince Medusa to brush. Only her hairdresser approaches Medusa with bravery and scissors, successfully solving the problem . . . with a short haircut! All are pleased with this drastic yet adorable solution. Leslie Patricelli’s depictions of this physical comedy bring a lively visual narrative to Joan Holub’s expertly focused text. 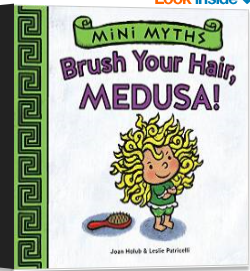 Includes a summary of the original Medusa’s Wild Hair myth at the end. Summary: Midas wants everything to be his favorite color – yellow! He chooses yellow clothes, eats yellow foods, and uses only the yellow paint at his art easel. But when he impulsively paints his beloved green Dinoboo, Midas discovers that too much of a good thing is a big mess! Joan Holub’s carefully crafted text is brought to life by Leslie Patricelli’s famously humorous illustrations. Includes a summary of the original Midas’ Golden Touch myth at the end. Joan Holub’s fascination with mythology inspired Mini Myths, a new board book series that translates famous myths into situations familiar to preschoolers. The first four titles are Be Patient, Pandora!, Play Nice, Hercules!, Brush Your Hair, Medusa! and Make A Wish, Midas! published by Abrams Appleseed. Joan co-authors two other mythology series for Simon and Schuster, Goddess Girls (ages 8-12) and Heroes in Training (ages 7-10). Her picture book, Mighty Dads, was a New York Times bestseller in 2014. Leslie Patricelli is the bestselling author-illustrator of many adorable board books, including Yummy Yucky and Toot! This is a genius idea! I had the book A Midas Touch as a kid but it wasn’t nearly as kidcentric as these. These books tie in perfectly with my own personal objective with my books to make learning fun and educational. I think that these toddler myth books are a great idea. I love these books! My kids love them too, even though they are technically out of the board book age group. You can keep them on your shelf and have siblings share the simple story. Then later on older brothers and sisters can explore the actual myth in greater detail. These are such cute lil’ books for lil’ hands!